When your business is considering implementing any new service that costs money, one of your first questions will be whether you have the budget for it. However, the bigger question is whether you can get a return on investment from allocating that budget to that tool or service. For instance, if you could make a $5000 investment that brought you a $200,000 return, it would suddenly be a lot easier find the budget for that item, even if you didn’t initially think that you had any spare cash to work with. In other words, it’s not necessarily about the presence or absence of budget, but rather the return that you can stand to gain. So let’s look at the return on investment for our Last Mile Shuttle Service in San Francisco. What do you get back when you invest in a service like this? While we can’t promise that you’ll get a return to the tune of six figures like in the example above, our shuttle bus company does believe that you get a lot in return for implementing a Last Mile Shuttle Service for your company. Here are some of the areas where you’ll benefit from offering your employees this option, in ways that translate to dollars. The way that Last Mile Shuttles work is that they provide your employees a smooth and comfortable ride from the last public transit stop to your premises, sparing them from having to walk. Then, at the end of the day, the Last Mile Shuttle will pick people up at the door and drop them off at the nearest stop for the Caltrain, BART, bus, or ferry. One of the biggest returns you’ll get from the investment in a Last Mile Shuttle Service is that your employees will arrive to work in a frame of mind that’s more rested, calm, and tranquil. Rather than having to fight with inclement weather and uncomfortable shoes while they walk to the office lugging a heavy briefcase and lunch bag, they can simply board the shuttle, ride in comfort, and walk in the door without breaking a sweat. The benefit of this is that it reduces stress and negativity. It also cuts down on the amount of time that gets lost at the beginning of every day while people are trying to switch gears for work and get their heads in the game. How much would even 15 minutes of extra productivity per employee per day be worth to you? If that dead space can be filled with productive work by implementing a Last Mile Shuttle Service, that alone could pay for itself many times over. Plus, there are lots of ideas of what you can do to enhance the amount that your employees take advantage of the shuttle. For instance, you could declare the first hour of each day an email-free zone and ask everyone to walk in the door having already checked their email on the shuttle’s wifi on the ride to work. (Obviously, this will not fit with all roles, but if you find that email is creating a distraction to “real” work, it can be an option to consider.) Or, you could hold a training on how to use the shuttle ride to get your head in the game so that you walk in to work charged up and ready to go. You could even choose a series of 5-minute clips of motivational, inspirational material to play over the shuttle bus’s speaker system. It’s no secret that San Francisco companies are competing harder than ever to win top talent. Employee perks like free food, transit passes, and nap pods are becoming more commonplace than ever. When your company offers Last Mile Shuttle Service, it can be a way to stand out from the pack and be noticed by the applicants whose qualifications would allow them to take their pick of positions around the Bay area. It’s an undeniable job perk when employees understand that they’ll be paying less for transit, won’t have to fight to park their car, and won’t have to settle for either hailing an Uber or walking from the last transit stop to the workplace. The return of landing even one all-star employee is Incalculable, as the work they do not only benefits you directly, it also raises the bar for everyone around them, causing coworkers and team members to also press on to new heights. Offering a Last Mile Shuttle Service is an easy way to make your company stand out among the other businesses where that people are applying, and it’s also affordable. Get a quote today. When we talk about intangible returns on your investment, these are things that don’t translate quite as directly to dollars, but that still represent a gain for your company. When you reduce the stress on your employees, they will be happier, and when people are happier, it cuts down on workplace negativity. Everyone knows how much poison even one negative employee can spread, and there are far-reaching benefits for reducing that negativity and fostering positivity and happiness. Another source of that happiness might be that your workers get to claim that little bit of extra family time (the amount of time they would have had to allocate to walk from the last transit stop to work). When you’re working 40+ hour weeks with a one-hour commute on both ends of every workday, even a fractional increase in family time is a gift. And a person doesn’t have to have a family to be happy about reclaiming that fraction of an hour. Whether they use that time for their studies, their pets. their hobbies, or just plain downtime, a few minutes of time is a valuable prize. Giving back even a few minutes of time to people can help them to feel more relaxed, and this, again, has benefits in the workplace. People who are relaxed outside of work have far more fuel to burn when it’s time to turn on the drive for performance at the workplace. My company is generous to their employees. People in leadership treat subordinates well. Implementing an offering like Last Mile Shuttle Service is a great way to trigger a flood of thoughts like these in people’s minds. Take the first step to getting Last Mile Shuttle Service for your business or workplace. 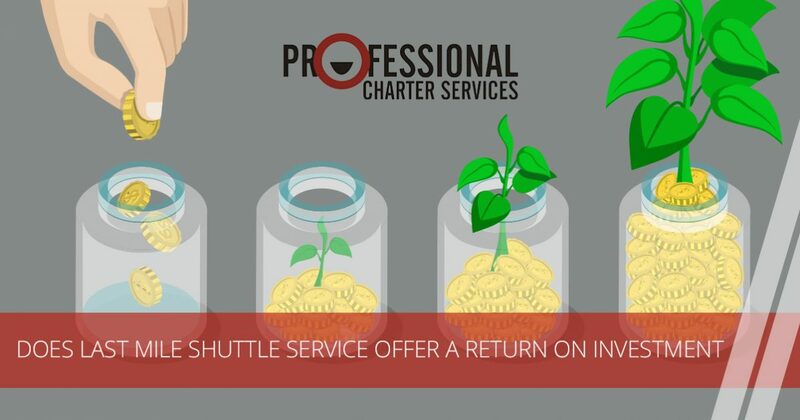 Ask Professional Charter Services for a quote today.